Sonic's back in 8-bit style. Following the undoubted success of Sonic The Hedgehog on the Mega Drive it seems only fitting that a version of the game was created for the Sega’s 8-bit wonder, the Master System which still had strong support in Europe at the time. This game was also something of a swan song to North American gamers who had took a chance on the Master System when the NES ruled the roost, it was the last game to be released on the system in the USA. In Europe there were several more Sonic games to follow and this game was even bundled for free on the revised Master System II hardware replacing Alex Kidd. 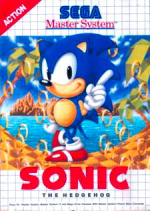 Despite the obvious technical differences between Sega’s 8-bit and 16-bit systems, it does not feel that any compromises were made in bringing Sonic to the Master System. This is a completely different game in its own right despite superficial similarities to its grown up cousin. Sonic’s nemesis, Dr. Robotnik is up to no good and has had the audacity to steal the magical chaos emeralds and hide them all over the land. To add insult to injury the evil genius has even locked up all the little animals and filled the lush green landscapes with nasty bad guys to ensure Sonic does not bring about his demise. What a cad! Don’t expect to get an easy ride in this incarnation of Sonic, there are several bottomless falls and precise timing is often needed to succeed. You also cannot pick up any rings again when you get hit, which really makes the end of level boss battle much trickier. The gameplay is a touch slower than the Mega Drive version and there are only ever about three bad guys on the screen at one time, but everything balances out nicely on the whole. Rather than the rotating special stages of the Mega Drive version, there are some timed obstacle courses in this game which you can attempt if you complete a level carrying 50 rings. These can be quite maddening, but are a good opportunity to snag some extra lives and continues so it’s worth giving them a go. With a bit of practice this game isn’t too difficult and even an average gamer should be able to learn to beat this within an hour with a bit of practice. The real fun comes in trying to find all six chaos emeralds which are hidden on certain stages. This really is one of the best examples of a platformer on the Master System and easily as good as Alex Kidd in Miracle World, if not even better. 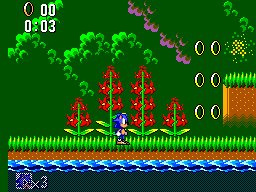 Many gamers will have been introduced to Sonic through this game before graduating on to the Mega Drive so for some it will certainly bring back good memories. For other Sonic fans who perhaps didn’t even know this version existed, why not take a chance on it? Sure it’s not quite as polished as the Mega Drive version, but it’s a slice of Sonic’s history which should not be missed. If you are at all slightly curious you should consider this for a download. At 500 Wii points you can’t really go far wrong. I never beat this game. Most I played of it was like 20 minutes or so in SADX years ago. I must admit that even though I have it on SADX, this is quite tempting. I just recently finished this game on the Sonic Collection. I was quite surprised and much better than I expected. If you have never played a Sonic game then start with the Genesis versions. If want more Sonic then this is a great addition to the VC library. It's short and fairly easy up unitl the last level. I have to tow the SMS flag with this game. I'm tired of the bad rap the SMS gets. Look up at the jungle level pic. It easily rivals anything youd see in Super Mario World. And that is an SNES game. Compared to the dead single pixel eye Mario has in SMB3, Sonic is quite detailed and surprisingly well animated for an 8 bit game. Granted, check the release dates, and this version of Sonic appeared 3 years after SMB3. Unfortunately, by 1991, 16 bit was all the rage, and nobody noticed how powerful the SMS was compared to the NES. 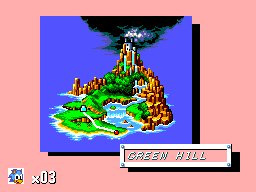 But this game (and the two sequals that followed) really showed off the SMS graphic prowess, which could easily reach TG16 depths and beyond. The one thing that holds this game back is the SMS 4 channel tinny sound. Also, the simultaneous release of the Genesis version sort of overshadowed the SMS versions. 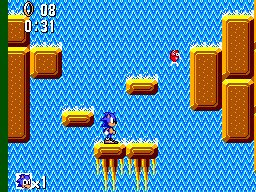 But looked at on their own, the SMS Sonic games have surprisingly detailed graphics that the NES could never touch, it's just too bad it was too little too late for the SMS. From 1986 to 1990 the SMS was riddled with lacklustre atari looking games (Phantasy Star the exception). It wasn't until 1991 that the SMS had the games that truly made it an NES killer, but that was too little too late. Ahh, this wasn't just my first Sonic game but my first game period, I still love it today and will probably buy this release at some point in the near future. One of my favorite Sonic games of the past. The game is fun and challenging which in my opinion is a great combination. Add in the high replay value provided by finding the 6 Chaos Emeralds and you have one of the best Master System games ever produced. I think I like this more than the Mega Drive version! It's a lot more slower paced and Mario like! This is a fantastic platformer, and my favorite Master System game. It's really a shame Sega never got Ancient to make more Sonic games (especially Yuzo Koshiro for the music), as the undoubtedly would have made a better Sonic 2 8-bit than what we got.